Farewell To The Legendary League Of The Pink Carnation This week, we're setting the NPR Books Time Machine for the Napoleonic Wars, and Lauren Willig's swashbuckling Pink Carnation series, about florally themed spies battling it out across Europe. 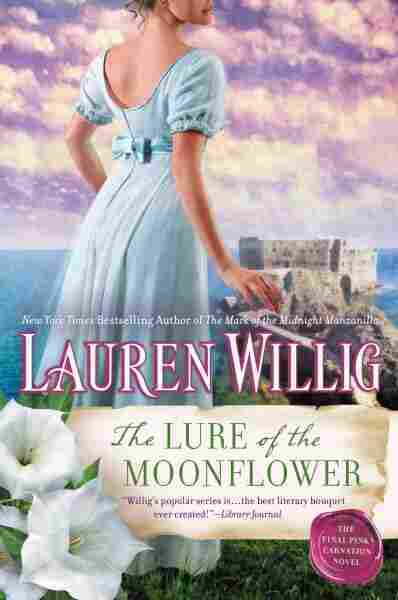 Earlier this month, author Lauren Willig released The Lure of the Moonflower, the last of her fantastic, genre-bridging Pink Carnation series. I call them genre-bridging, because they satisfy romance fans who love the pinch-in-the-chest, soul-satisfying, "all is well in the world" happy-ever-after denouement — but they also have such densely detailed and gratifying historical, swashbuckling, spy-based plots that nonromance fans love them too. The series begins with The Secret History of the Pink Carnation, and over the course of a dozen novels and a few short stories and novellas, tracks a mysterious English spy ring with frivolous, flowery names (literally: There are the Orchid and the Crimson Rose, and their enemies, the Marigold and the Black Tulip, to name a few), many of whom are women. The strand that binds all the stories is doctoral student Eloise Kelly, who is researching famous Napoleonic-era spy Lord Richard Selwick (aka The Purple Gentian), in hopes of discovering the true identity of the titular Pink Carnation. When Arabella Selwick-Alderly opens her archives to Eloise, her nephew Colin tries to thwart the research, certain Eloise is preying on Arabella's good nature — kicking off a rocky romance that ebbs and flows across the series. What is so striking about these novels is the way Willig manages to weave history and fiction together. And I don't mean simply integrating historical figures into storylines, which she does, seamlessly and authentically. No, Willig is doing research worthy of Eloise herself, finding tidbits of real history that were nearly lost in the mists of time and making them live — even as readers raise their eyebrows in disbelief. It's often the historical realities that are harder to believe than the fictional twists, but at the end of each book, Willig includes a lengthy note that explains her exhaustive research and offers a list of references. The books are effervescent and thought-provoking; both a romantic romp and a serious exploration of human nature. The books deal with, among many other things, the madnesses of England's King George III and Queen Maria I of Portugal; Robert Fulton's submarine trials in France; the social, political and employment displacement that half-castes faced in India; Irish aid for a French invasion of England and the farcical way those hopes went up in smoke; the continued real and perceived threat to the throne by a Jacobite heir; and all sorts of broad geopolitical concerns that Willig repurposes in intimate and personal ways. The novels traverse the globe, from London and India to Portugal and Napoleon's court. But they also span a vast emotional canvas of complicated personal and political dynamics — against the backdrop of a highly satisfying romance and a narrative that promises a happy ending. Willig's tone is almost always light and breezy; her storytelling is brisk and upbeat, her characterizations peppered with dry humor and occasional silliness. There's so much going on in these books that the Happy Ever Afters are just the cherry on top. In some ways, The Pink Carnation series represents the best of women's fiction. Yes, the narration is jaunty, and there is a romantic arc and a happy ending, but those things don't undermine the books' emotional punch as Willig explores issues like national, social and academic politics; the emotional toll of betrayal and abandonment; and the confusion of shifting alliances — that's why the books have such a broad spectrum of fans, both inside and outside the romance community. I encourage you to discover Lauren Willig and The Pink Carnation series, if you haven't already. The books are effervescent and thought-provoking; both a romantic romp and a serious exploration of human nature.